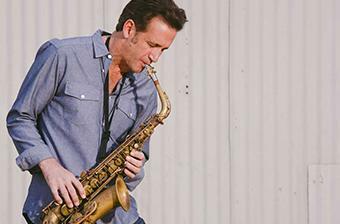 Eric Marienthal has shared a wealth of musical knowledge in hundreds of jazz saxophone lessons online. Students in the jazz sax course have unlimited access to these video lessons, as well as saxophone jazz charts, backing tracks and study materials. What ultimately sets these jazz saxophone lessons online apart from other offerings is the ability to submit a video for review using the ArtistWorks Video Exchange Learning® platform. Eric reviews each submission and records a video response, offering specific guidance to take your saxophone playing to the next level. All students can access the Video Exchange library and watch each other’s interactions with Eric. This library is constantly expanding and may contain the key to unlock your playing. Eric Marienthal is a Grammy® award winning jazz saxophone musician. He studied at the Berklee College of Music in Boston where he eventually was awarded the Berklee Distinguished Alumnus Award for outstanding achievements in contemporary music. He later became an integral member of the Chick Corea Elektric Band, where he recorded 6 albums and received 2 of his 5 Grammy nominations. He has since performed in over 80 different countries and has recorded 13 solo albums. Some of the many artists Eric has performed with include Elton John, Barbara Streisand, Billy Joel, Stevie Wonder. The online lessons here at ArtistWorks feature both alto and tenor saxophone. Great experience!! My teachers are awesome. you always get you questions answered from your teacher. Esta pagina es increible, la recomiendo 100%. Saludos y muchas gracias. This page is incredible, I recommend this page 100%. Greetings and thank you very much. I've been playing the saxophone for over 40 years, but I learn a lot from Eric Marienthal's lessons and feedback, giben to me or to other students. The programme is well balanced between sound production, technique and improvisation. And Eric is s great (and funny) teacher! I have amazing teacher. Yeahhh!